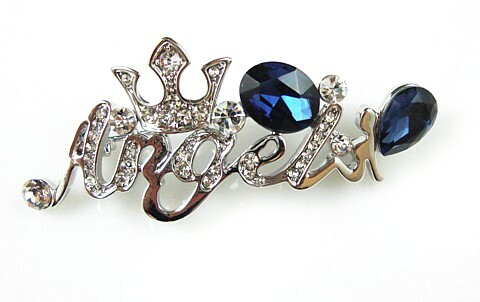 In this enchanting brooch the word “Angel” is spelt out in a silver finish, topped with two large deep blue rhinestones, smaller clear crystals and finished with a crown. Those who believe in angels can wear it in homage to the celestial beings who guard and protect us through life. This divine brooch also makes a perfect gift for those special people we hold in our thought and dreams and prayers. Silver finish. Size: 6cm x 2.5cm (2½" x 1").